SPRING AND FALL VACATION WEATHER IS THE NICEST! Reserve now and ensure you get the dates you want! WE BREED MIXED GOLDEN RETRIEVER/YELLOW LAB PUPPIES! 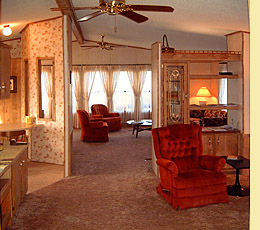 you won't do better than The Bunkhouse at Liberty Haven Ranch. 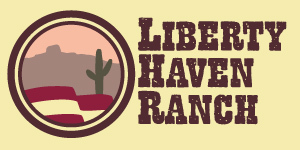 Liberty Haven Ranch is located in Morristown, Arizona -- an historic whistle-stop between Phoenix and Wickenburg, site of the first and largest gold strike in Arizona. Our elevation is higher, and temperatures run about 5° cooler during the day than the forecasts for downtown Phoenix, and much cooler after dark. Shopping, restaurants, golf, and the other necessities of day-to-day existence can be found in Wickenburg, just a short trip west. In the other direction, major attractions, stadiums, and upscale bistros and boutiques are all available in the metro Phoenix area, just 30 miles down the highway. 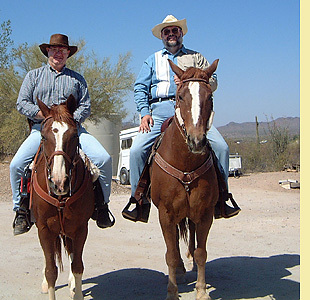 If you want a base of operations to explore the rest of Arizona, The Bunkhouse is a perfect choice. Our gated residential area is private, quiet, and secluded, and sits among sage, saguaro, and cholla. However, the Ranch roadways open onto two major state highways, and a private airstrip is available for the use of our guests. 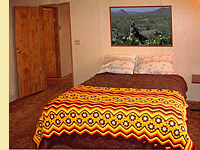 The Bunkhouse is a rustic two-bedroom, two-bathroom furnished guest house in the gated residential area of the Ranch. 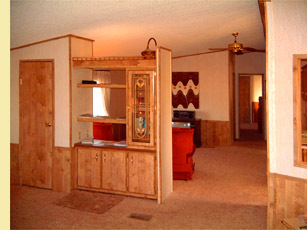 It is a manufactured home of 1,200 ft2, typical of contemporary Arizona ranches. 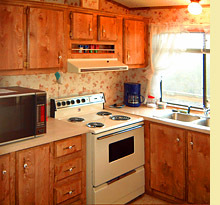 The Bunkhouse is fully heated and air-conditioned; electricity and water are included. 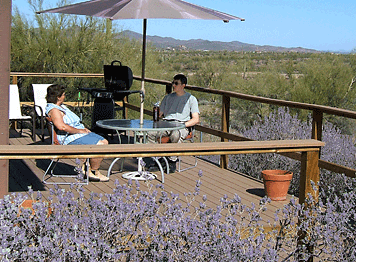 A wraparound deck with shaded dining set and gas grill provides a superb view of virgin Arizona desert, and a handy gate allows immediate access to the outback from the fenced residential area. Despite its evocative name, the Bunkhouse is not an accommodation shared by multiple simultaneous guests. It is reserved exclusively to one party at a time. The modern eat-in kitchen includes an electric range, high-output microwave, full-size refrigerator with icemaker, double-well stainless sink, coffeemaker, and instant hot water dispenser. An assortment of cookware, dishes, and cutlery is furnished for your use. Coffee service and chilled water are provided upon your arrival. ...or just curling up with a good book. 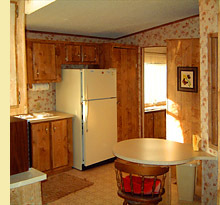 A separate dining area adjoining the living room opens from the kitchen. The Bunkhouse sleeps six in total comfort. Linens are provided. The master suite is furnished with a queen-size bed, and a private bathroom with double sinks and a large shower with seat. Two twin beds comprise the second bedroom. The queen-size convertible sofa in the living room provides additional sleeping accommodations, and sleeping bags are provided for groups larger than six. A second full bathroom opens to the hallway outside the master suite. The laundry room in the Bunkhouse includes an electric washer and dryer, plus a laundry tub. 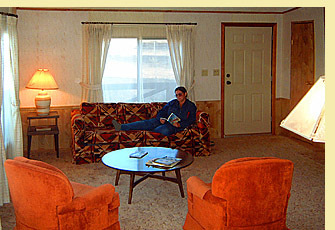 The common area features a 27" flat-screen TV with VCR and DVD players, and an AM/FM/cassette sound system. 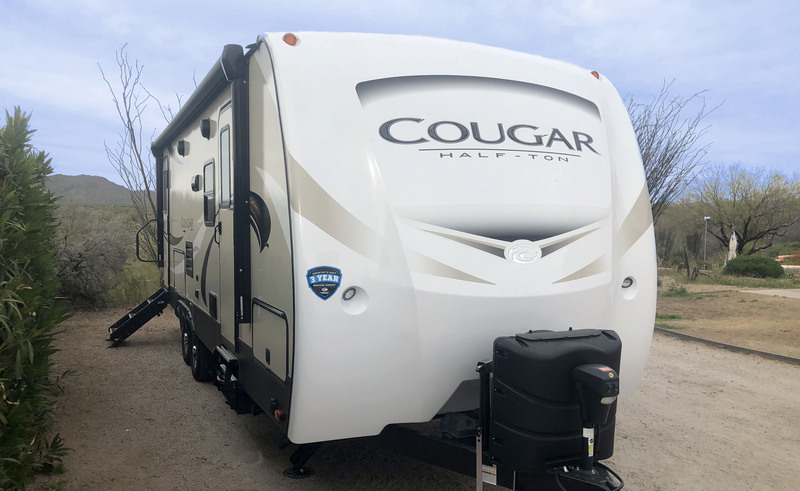 For singles and couples planning shorter stays can we can offer comfortable, modern accommodation in our fully-furnished 2019 Cougar travel trailer. See full details and more photos of our Cougar unit here. Swimming: Bunkhouse guests can take advantage of our heated swimming pool in season (typically mid-April through mid-October). Shooting: Receive pistol and rifle instruction from an experienced NRA- and state-certified instructor. Take an introductory rifle and pistol course, or rent time on our 50-yard on-site range with gong, spinner, and paper targets. 200-, 300-, and 600-yard distances can also be arranged. BYO firearm or rent one of ours. All NRA safety rules enforced. 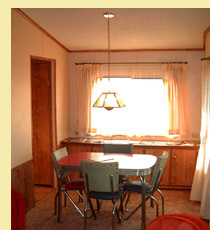 RVs: The Ranch offers three hookup spots with water and 30A power. There are also endless, spacious slots available for short-term "boondocking" (dry camping). A free tank dump facility is provided onsite for our guests. Horse Camping: Enjoy one of our spacious RV slots while you board your horse(s) in our clean and roomy pens or turnout corral during your stay with us. Plenty of extra parking for your horse trailer while you enjoy the trails, climate, and scenery at the Ranch. Stargazing: The Bunkhouse is far from city lights. The cloudless skies and desert air give you the same view of the night skies that the ancients had. The moon is more compelling, the meteor showers more exciting! 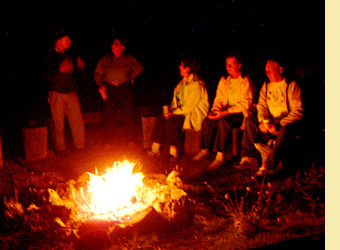 Informal basic astronomy orientation session available by request. 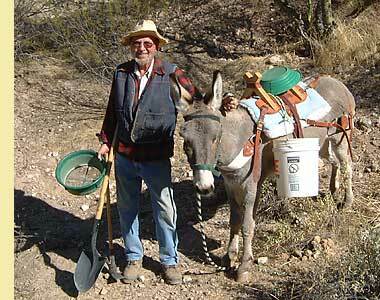 Internet: The Ranch is served by high-speed wireless internet. The entire Ranch is covered by a wireless "hotspot" for our guests' use. 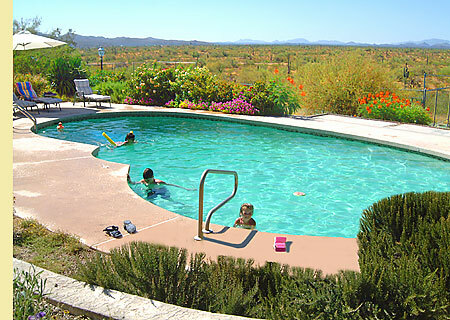 Day Trips: Our central location makes exploring Arizona affordable and convenient. You can enjoy Sedona's scenery, Lake Havasu's London Bridge, Prescott's rodeo, Scottsdale's shopping, Mariners/Padres/Royals/Rangers' spring training games, Peeples Valley's cattle auctions, Quartzsite's RV festival, Phoenix's nightlife, Salt River tubing, and even Oatman's burros, and still be back the same night! In deference to certain of our regular guests with sensitivities, the interior of the Bunkhouse is kept smoke-free and animal-free. Smoking is permitted on the decks, and local kennel facilities are available for pets. Check our online reservation calendar for an estimate of our availability (reservations shown are subject to change) -- then phone us at (623) 640-7880 with your proposed itinerary to assure availability of your chosen dates. If your chosen dates are already taken, consider our deluxe trailer lodging, perfect for singles or couples, for shorter stays. Significant discounts are available for high-season dates that are still unreserved within 60 days of arrival. Phone the Ranch at (623) 640-7880 for a quote. J. and I got home yesterday and we just wanted to let you know again how much we enjoyed the our stay at your ranch. We wanted to say good bye Sunday morning... but Jennifer was getting so upset to have to leave Heidi and Honey that we decided to just hurry and pack up and go... before she decided she wasn't coming! I just can't tell you how much fun we had and how much J. especially liked the whole ranch. We do plan on coming back and staying again. Thanks again for all the wonderful stories and for being such nice people. The view was spectacular, the accommodations comfy, and the hospitality warm and gracious. We hiked Vulture Peak five times, plus miles of your desert outback. We want very much to be able to come back next year. You have a beautiful piece of heaven here in Arizona. We all had a great time, and we would certainly love to stay here next time we are out this way. What a beautiful place to be! Comfy and spacious, peaceful and quiet. The view is awesome. We had great fun playing with Fergus and Tracey, such well-behaved dogs. We just wish we were younger, and could have taken a horseback ride and a walk in the desert. Thank you for your hospitality. We loved the privacy and the animals. The desert greened daily. Wonderful weather. It was all that you advertised and more! Call us when 2005 reservations open. Simply superb! The attention to detail and the ameneties couldn't be better! We enjoyed our peaceful three-week stay. The home and views are wonderful. We will definitely recommend your ranch for a great getaway. You're always our first choice! Our second stay with you was just as enjoyable, peaceful, and quiet as the first. The roses are especially beautiful, and so large! Wonderful accommodations. We enjoyed our stay! You thought of every convenience! We loved the beautiful starry night! Reservations require a 50% deposit. Deposits may be mailed to the Ranch, or (for a small surcharge) remitted via PayPal -- please call first to verify availability of dates. All material on this site © 2003, 2004, 2005, 2006, 2007, 2008, 2009, 2010, 2011, 2012, 2013, 2014 Liberty Haven Ranch.